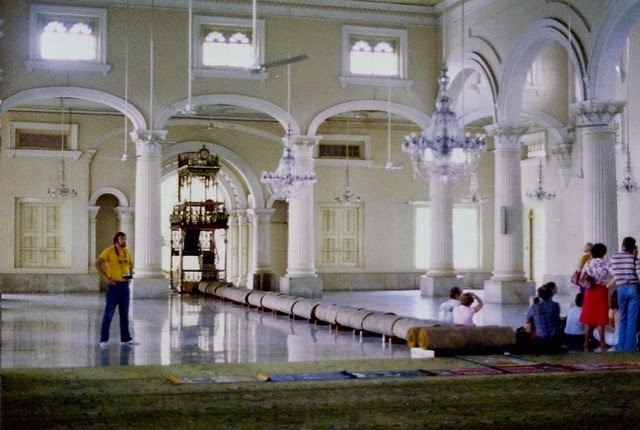 These photos give you some idea how large the prayer area (sorry I don't know the official name) was in the mosque. 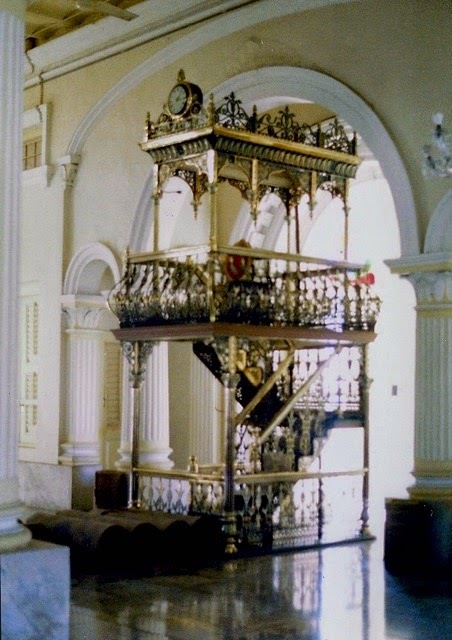 Some people asked me about the significance of the clock on the top of the altar ( see a closer photo in last week's post) but I can't remember. I'm guessing it has something to do with the call to prayer. 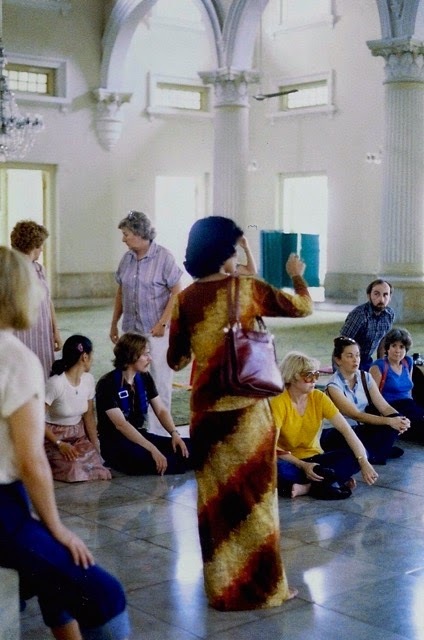 If I remember correctly, they prayed four times a day. Garter-stitch is becoming a new love of mine, especially for baby blankets, as it is thick and cuddly. This scrap blanket was knit on US size 11 needles with double strands of yarn, one light and one dark. 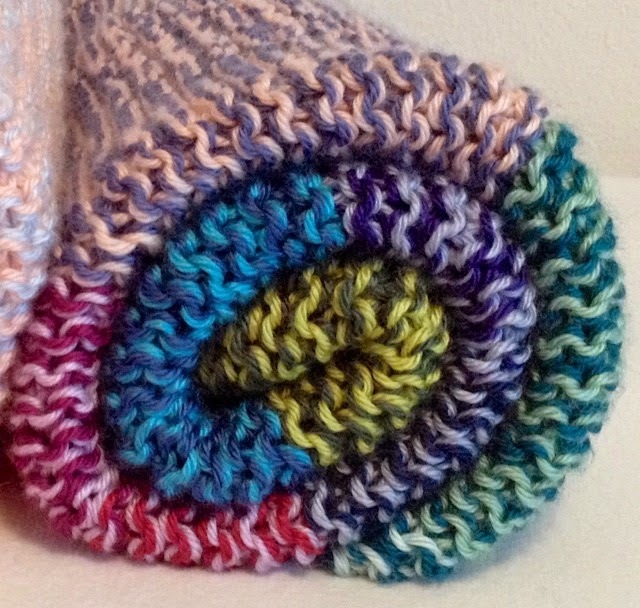 The blanket will be donated to a local charity along with the Gradient Garter Blanket shown in an earlier post. 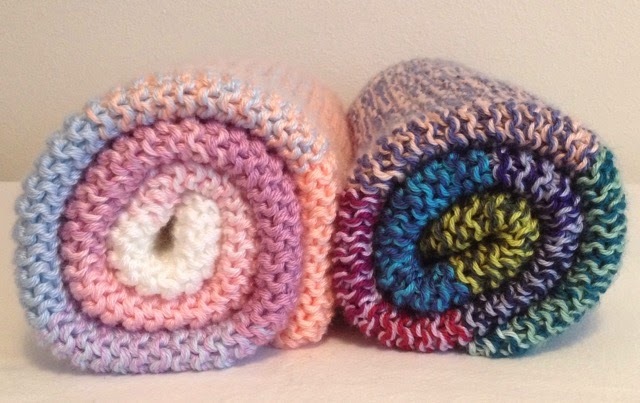 Have you knit anything in garter stitch recently? Next weekend, clocks will be set one hour earlier and with that action comes the anticipation of Spring. Can it really be just around the corner? In yesterday's post, two fabrics were auditioned for the blue border surrounding the flag panel. Even though the panel and the striped border contain the same hue as the light blue fabric, I decided to use the dark blue. 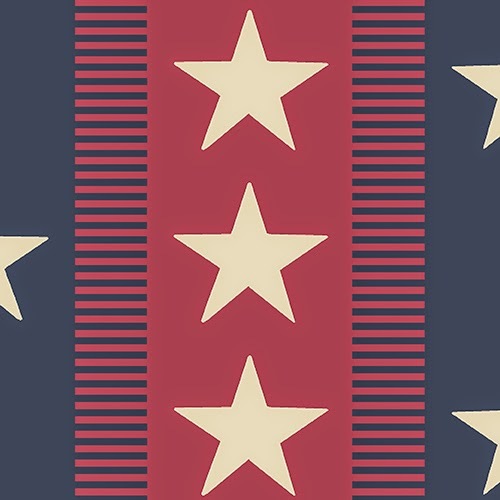 I thought the bold flag panel needed a more contrast, which the dark blue provided. From the comments everyone left yesterday, it appears that many of you agreed with my decision. Great minds think alike, right? 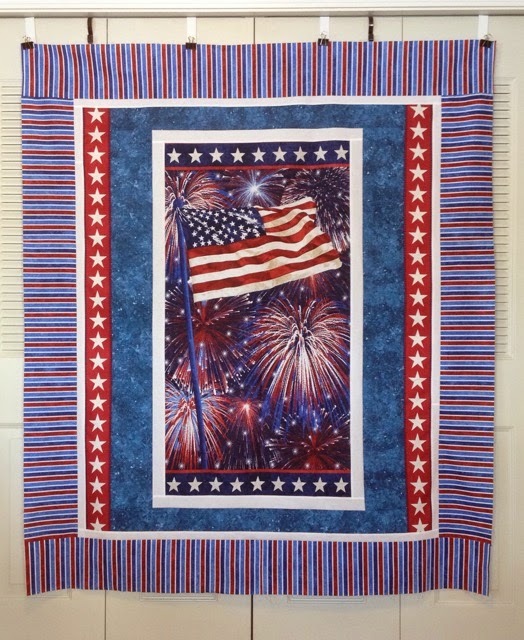 Celebrate Freedom is #57 in my quest to complete 64 Quilts of Valor by the end of July. The complete list of QOV that I've made can be seen here. Last week, I explained how Andover #7787-R was the perfect fabric to add width to the narrow flag panel. I wanted to do something similar, using the stars with the red background. The red strip was nearly two inches smaller than the blue strip, so I needed to find some yardage in my stash that would complement it. 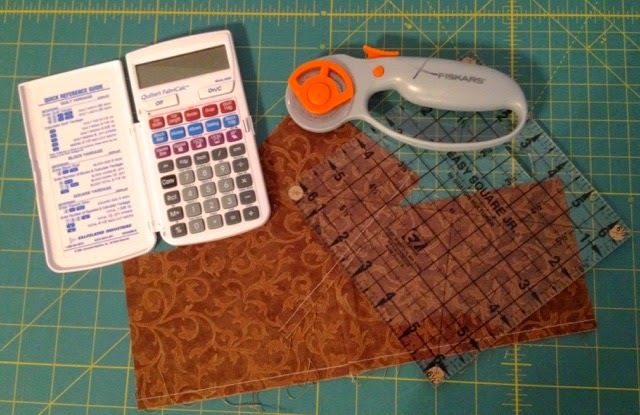 I found two pieces of blue yardage that I thought would work. Whenever I am working on a quilt, I often "audition" fabric by laying it out on the floor. Sometimes, I take photos and see what appeals to my eye. If I am uncertain of my choice, I ask for opinions from my sisters, my niece, and friends. 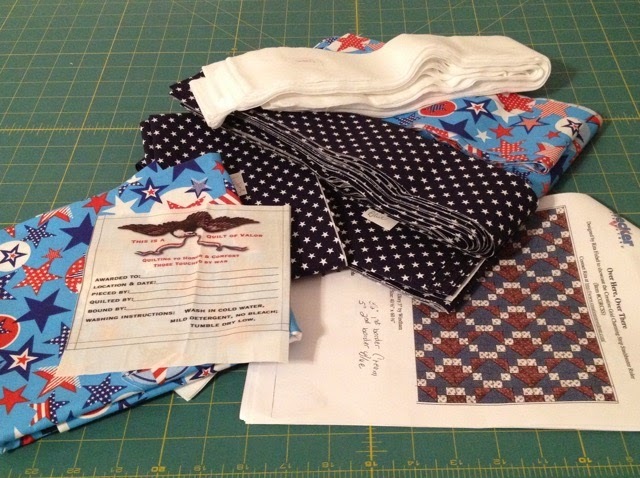 Can you guess which blue fabric I used for the borders on Celebrate Freedom? Check back tomorrow to see the result. The flag panel for Rockets Red Glare is long and narrow, and in order to meet the Quilt of Valor (QOV) requirements, I needed to add width. Nothing I had in my stash looked right with the panel, so it marinated in my sewing room. 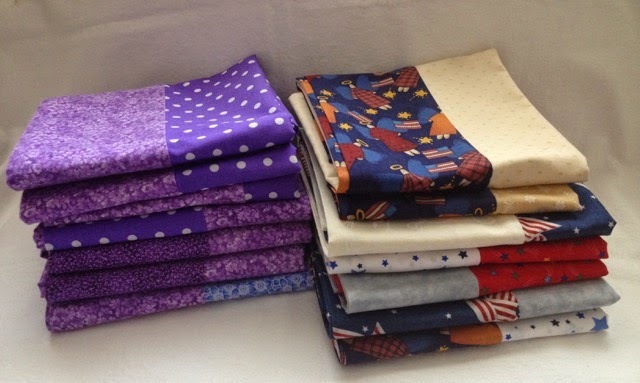 I found the perfect star fabric at the Wild West Winter Quilt Show on February 7, 2015: the fabric line was first released in January 2015. I cut two strips of the stars with the blue background and used them to add width to Rockets Red Glare. I also purchased the "antiqued" version of the fabric for future projects. 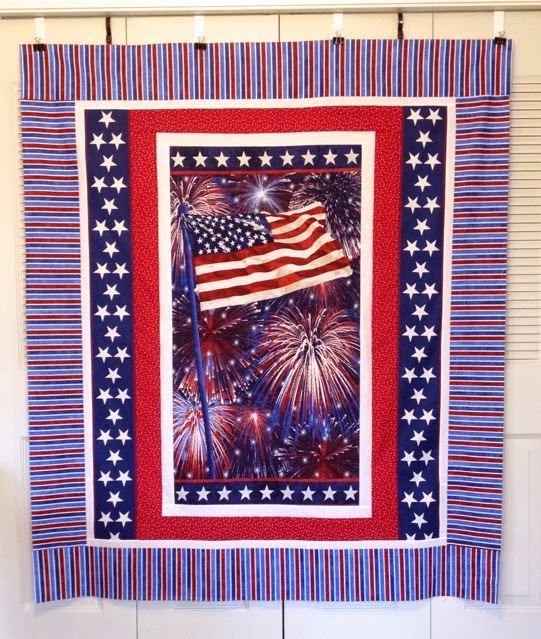 Rockets Red Glare is #56 in my goal to complete 64 Quilts of Valor by the end of July. A complete list of the QOV that I've made can be seen here. 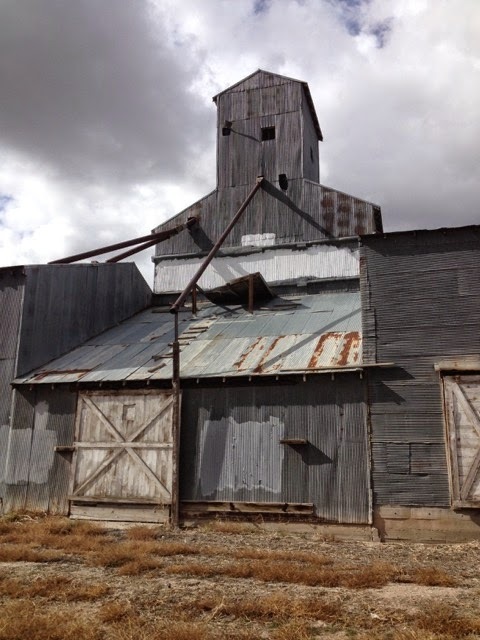 The doors to the railroad locking docks have been barred for years, but once these portals were open and the warehouse bustling with individuals unloading freight and feed, running the auger to unload/load grain, beans, or corn. The Co-op was the lifeblood of the agricultural community surrounding Riverton. Of course, there were other grain elevators in town, i.e., Hughes Elevator, and the Farmer's Exchange, but the Co-op outlived them all. 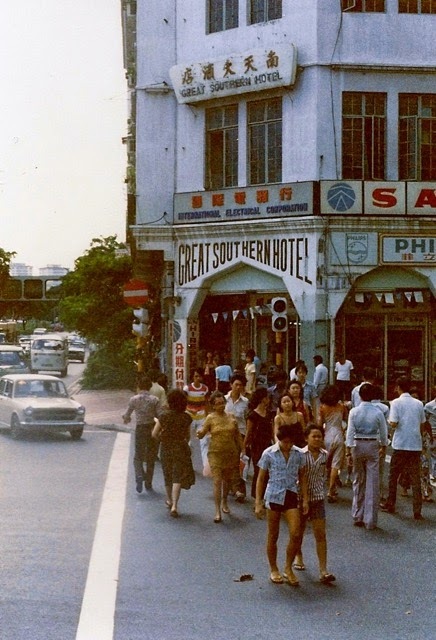 I remember how cool the building was in the summer, the air swirling with grain dust, and the scents that were earthy, familiar, and comforting. Farm trucks loaded with oats, beans, corn, and other crops were weighed and unloaded on the other side of the building. Other times the trucks were filled from the various bins within the building or the adjacent silos. The south end housed salt and mineral blocks, milk replacer, large bags of dog/cat food, canvas dams, and baling twine. Later an office building with larger scales was added along Federal Blvd. This building also housed a shop in the back where mechanics repaired tires and changed oil. The front section of the new building offered veterinarian medicines and salves, and an assortment of hand tools, but it was the elevator that was the flagship of the Co-op. It is still standing and utilized. My Dad was a member of the National Farmer's Union Co-op, and anything that was needed for the farm was purchased at the Co-op, if it was available. I remember attending Farmer's Union meetings at the Grange Hall in Pavillion, Farmer's Union picnics at Diversion Dam, Farmer's Union camps at the Fremont County Fairgrounds during the summer. I attended the Winter Carnival Quilt Show on February 7, 2015 and selected a free kit for a Quilt of Valor. 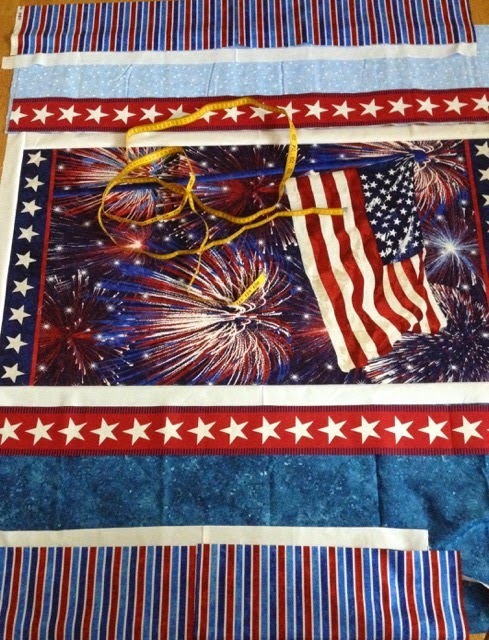 The Wyoming QOV coordinator asked that the finished quilt tops be returned to her before August so they could be quilted. The fabrics in my kit were precut, so making the top was quite easy. Once I had all the blocks made, I placed them, according to the included diagram, on my design floor. Something about the block placement bothered my eye. 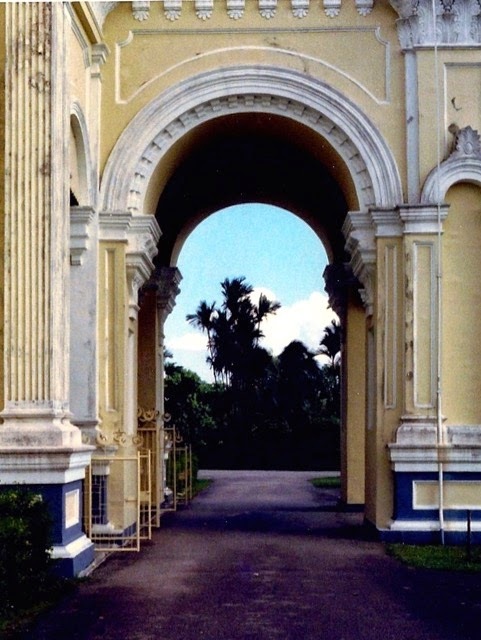 The dark blue and light blue "arrows" were aligned in rows and headed in opposite directions, however, all my eye could see was a chunky dark blue house shape. I flipped one of the rows of blocks and saw a chevron, so I flipped every other row of blocks which resulted in a design where the "arrows" were alternating in each row. My eye was much happier with this design. The chunky houses were gone. I asked my sisters, niece, and a friend which setting they preferred. My sisters liked the original design; my niece, my friend, and I liked the revision. 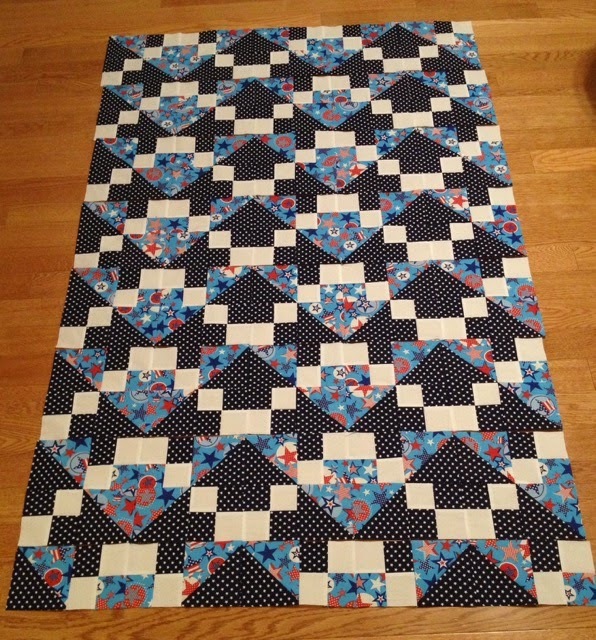 The majority ruled, so the rows were sewn together, using the alternate design setting. I prepared a backing for Flight Pattern and delivered it to the QOV coordinator on Friday. She was surprised to get it back so quickly. 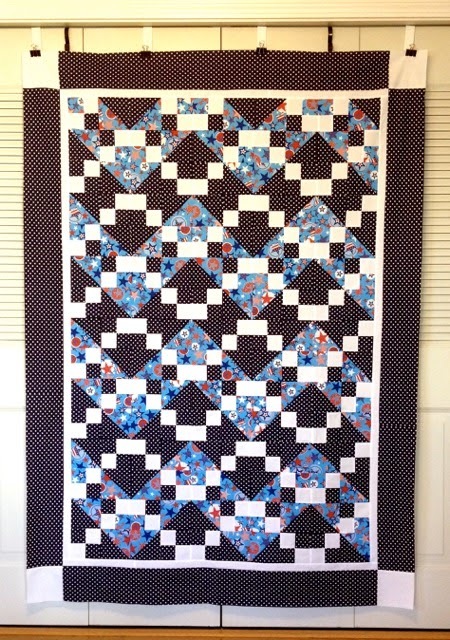 A complete list of the Quilts of Valor that I've made can be see here. 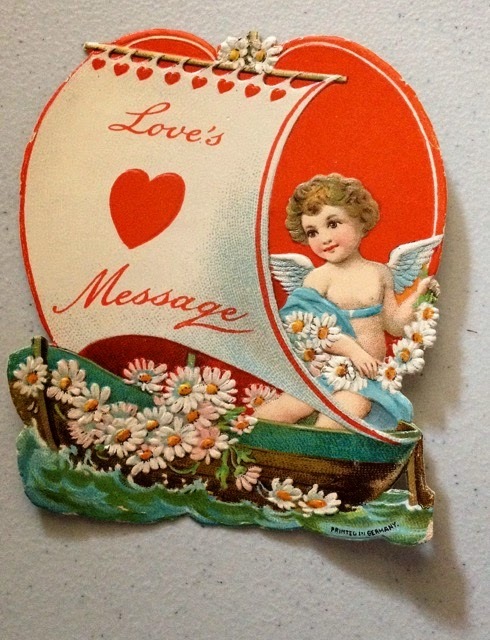 Even though this vintage Valentine doesn't feature a cartoon character, glitter or a silly verse, its message is timeless. The angel's face is very expressive, and I think it resembles that of my great niece, Stephanie. This treasure is tucked in a Depression glass cup in the china closet. I keep it because my mother kept it: it was obviously dear to her. 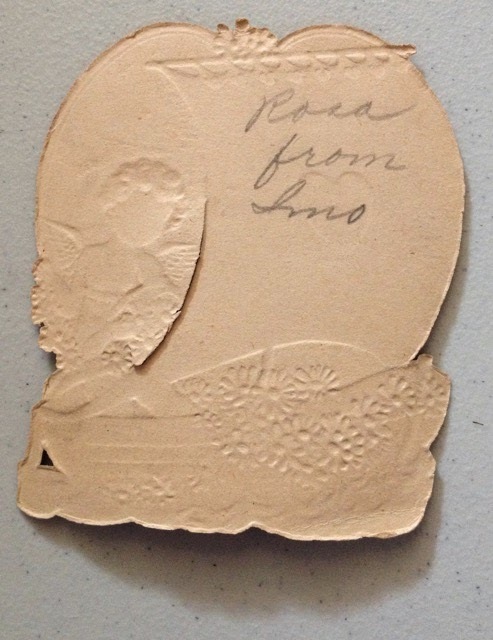 I don't have a clue to the identity of "Imo," but I think it is short for Imogene, possibly a childhood friend of my mother. It is written in pencil. Note the slit in the card: I wonder if it held a sweet treat. Did you save any Valentines from your youth? 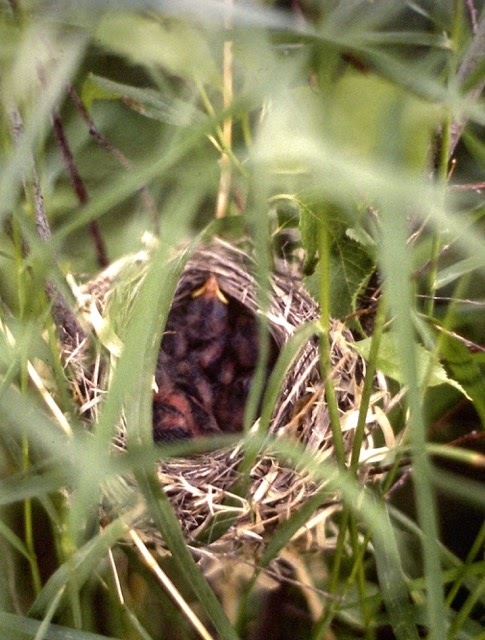 Another photo taken at this site can be seen on this earlier post. 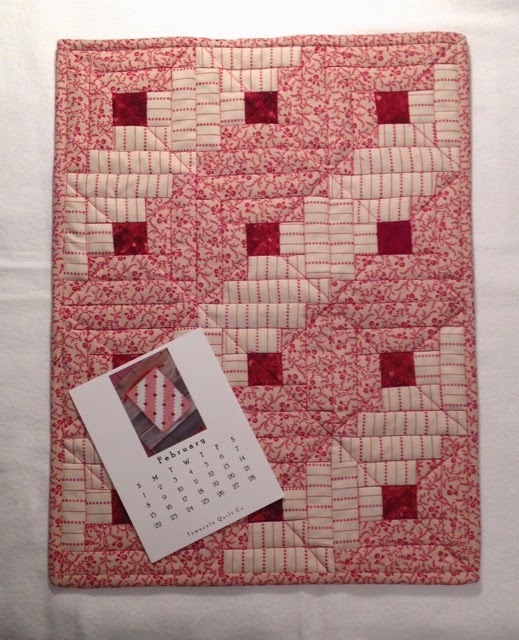 Sweet Valentine is the small quilt featured on the February Temecula Quilt Company 2015 calendar card. Check it out and create your own small quilt for February. It started several weeks ago when I received an "undeliverable email message" after posting a comment on Thankful Me, then it expanded to JulieKQuilts, to Dakota City Quilter. Recently, The Quilter, Irish Eyes Knitter, Suburban Jubilee, This and That, High Plains Footprints, and Institches with Bonnie were added to the list. 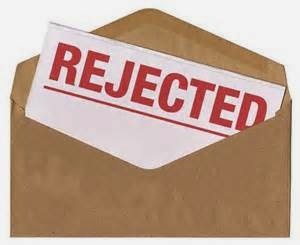 I've read and commented on many of these blogs for years, so why are my comments bouncing and the blog owner no longer receiving emails for the comments I left on their blogs? After a lot of research and frustration, I have discovered, despite the "advice" show above there is little I can do to change this frustration because in order to comment, I must be signed in with one of the required profiles. Mine is Google, and I have NO control or how Google lists the "From" and "Reply to" format. It's little comfort to know that I am not the only one frustrated over this issue. What discourages me more than anything is to see this was an issue in September 2014, and it STILL hasn't been fixed. To the bloggers listed in the first paragraph of this post and to those who no doubt will be affected in the future, I apologize that my comments will no longer be emailed to you, but rest assured that I will continue commenting on your blogs. I'll miss the "chats" that came from my comments and your responses. I know that some bloggers now respond to comments directly on the posts, but I don't have that kind of time to return to specific posts to see if a response has been written. I don't want to spend even more time on the Internet than I already do. Several individuals' comments (FarSide, JudyS, Marti, Pat, and others) suddenly stopped being emailed to me, and now I understand why that happened. I have learned to check my posts for their comments and respond accordingly. If I haven't responded to your comments recently, it's not that I don't appreciate your thoughts; it's because your comments are probably NOT being emailed to me, and I don't have your email address. This situation all resulted from hackers and dishonest people who feel the need to ruin things for others. I refuse to allow these individuals to hijack my blog and the friendships that I've made through the comments I left on others' blogs and from those left on mine. If I have a means to communicate with you (i.e., and email address), I will keep in contact. You can email me anytime, using the email given at the top of the righthand column of this blog. 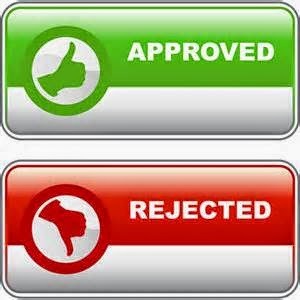 Have you been "rejected" yet? Were you able to find a solution or know anyone who has? 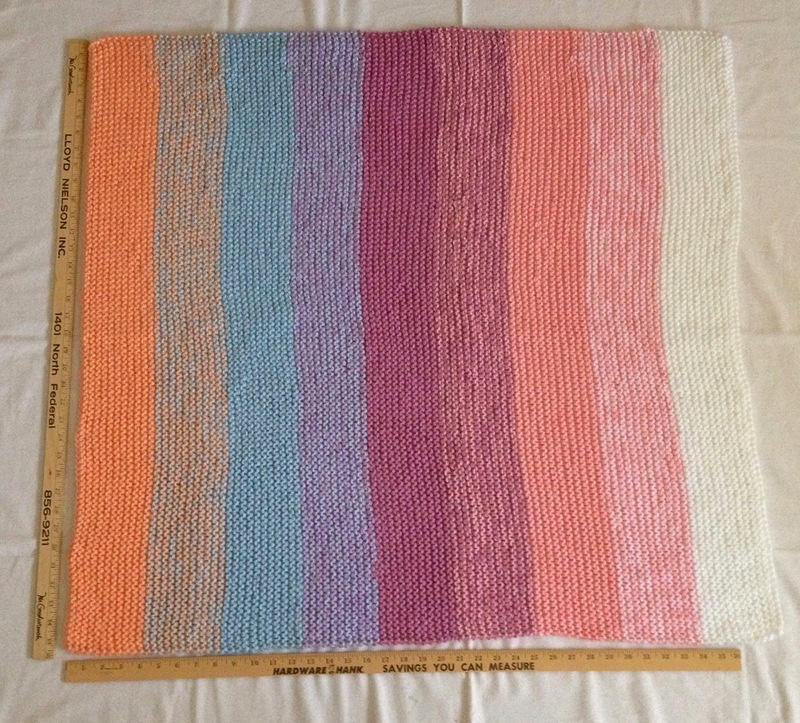 Yarn: Lots of Caron Simply Soft (Soft Peach, Baby Blue, Orchid, Soft Pink, White) as the blanket is knit with two strands of yarn. Impressions: this makes a thick, heavy blanket and is a fun and mindless knit. I've already started another blanket, using scraps. While cleaning and organizing my sewing room, I found some scraps and yardage that I no longer wanted hanging around and taking up room. That pile of fabric was turned into 14 pillowcases. Now, they are laundered, pressed, and ready to become useful. I have no idea how the purple fabric found its way into my stash because it is one of my least favorite colors. Update: the purple cases were donated to the local hospice home, and the other cases will be used for QOV presentations. 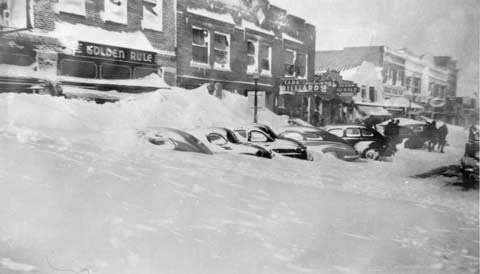 Last week's blizzard in the New England states will go down in the history books as a memorable storm system, but many old timers in the West remember the Blizzard of 1949. Several years ago, this article about the Blizzard was published in the Wyoming Tribune Eagle. Snow plow leading a convoy of truck loaded with hay to feed stranded livestock. 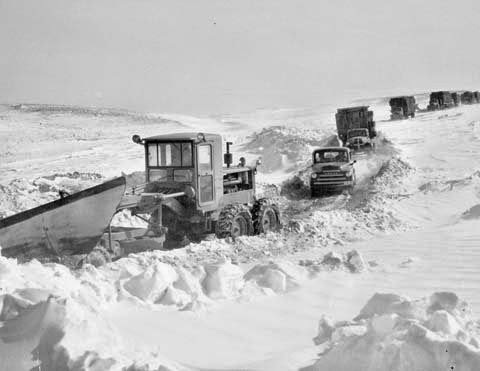 At my Uncle Otto's funeral, I learned he was employed by the state of South Dakota for several years to clear the highway from Edgemont, SD to the Wyoming line of snow, and that he did it with a team of horses. I can't even begin to imagine the conditions that he must have endured while doing this job. 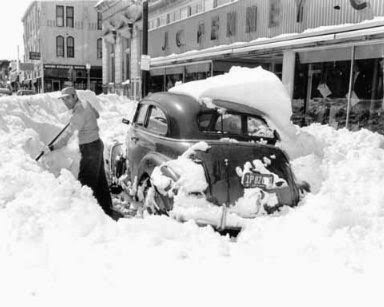 This video includes interviews of old-timers who experienced the Blizzard of '49 in Nebraska. 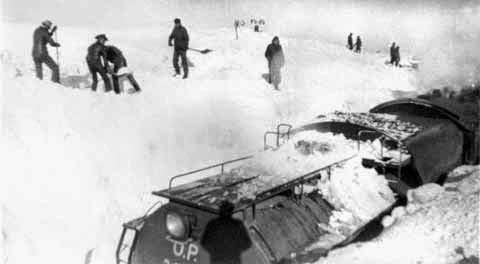 Did any of your relatives experience the Blizzard of 1949? 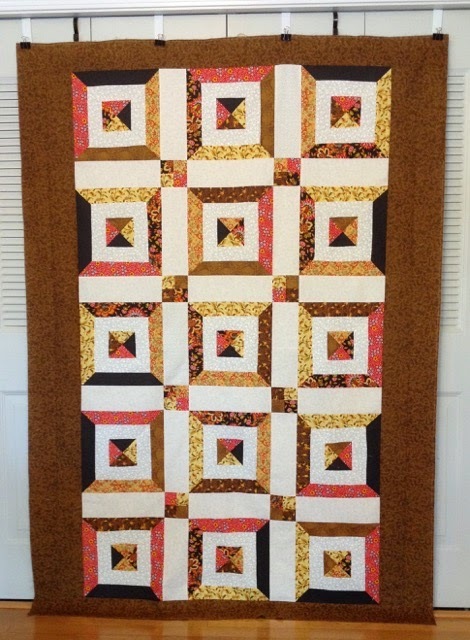 Walkabout was created using scraps from Autumn Splendor and the brown border I removed from Kismet. 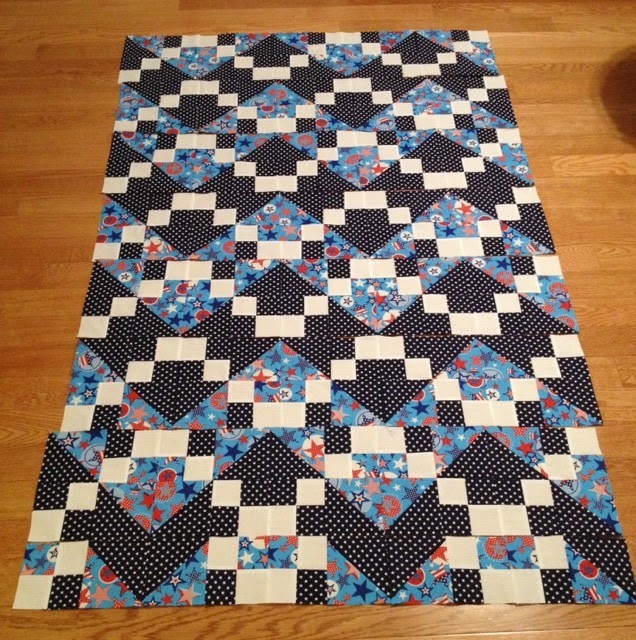 In fact, I had just enough of the brown fabric for this quilt, as the photo above shows the remaining scraps are minimal which made me very happy. She Has My Back. . .